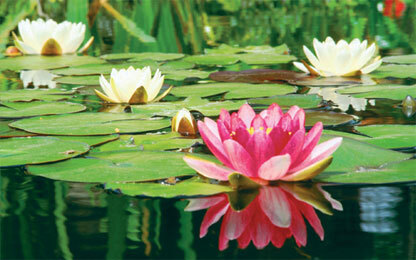 The Water Lily is a well known, beautiful flowering plant, with both floating and sometimes submerged leaves. An individual Water lily will require a large amount of space, generally between 10 to 30 square feet of surface area, and they need strong light, preferably sunlight. They will also require an extended resting period either at low temperatures (as a normal ‘winter’ type rest), or time away from water in dry or moist sand. Because of these requirements, they are generally more suited to the pond environment. However with a dedicated effort to work within their requirements, they can be used in a specialized aquarium where a surface cover is desired. The “Hardy” Water Lily will produce large round leaves about 6 inches in diameter that will cover the aquarium surface, but if deprived of light will produce short compact leaves from its root. If it is doing well, it will send out flowers that rest on the surface. Flowers are white, gold, pink, or red and some are heavily perfumed. In an aquarium a Water Lily will require space and intense lighting. It should be kept in a large flower pot filled with peat, sand, and loam. Add a 1 inch layer of gravel on top to discourage the substrate from floating around. The lighting can not be provided only artificially, so the aquarium should be positioned in front of a south facing window. The aquarium must be filled with at least 12 inches of water. Surface area should be at least 250 square inches. The aquarium can not be covered. The water lily needs a winter dormancy period at about 53° F (12° C). Water must be as soft as possible. AquA AnimaniA is your #1 local source for Water Lilies along with a large selection of healthy live aquarium plants and other robust pond plants. We also feature a wide variety of small animals, pets, aquarium fish, pond fish, amphibians, reptiles and more! To properly care for your pets, we also carry a comprehensive and extensive line of pet supplies including equipment, foods, treats, aquariums, tanks, cages, supplies and toys for dogs, cats, birds, small animals, amphibians, reptiles, fish, exotic pets and critters.